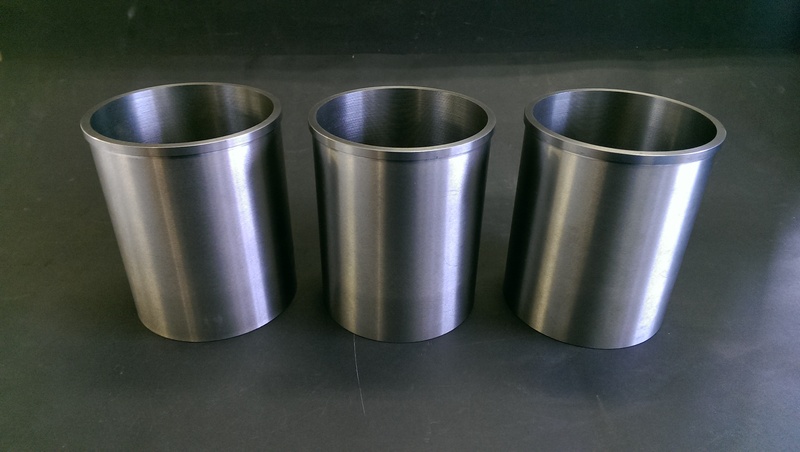 Cylinder liners can be used to reclaim or repair cylinder bores which are severely damaged, excessively worn, cracked, or which have previously been machined for the maximum available oversize piston. Various types of liner are available for repairing both specific and generic engine types. These include semi-finished dry liners, fully finished dry liners and wet type liners. Dry liners can be either parallel or flanged, where the very top of the liner is a larger diameter to the main body. 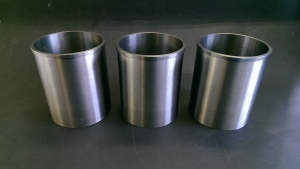 These liners are usually an interference fit into their housings whereas a Wet Liner is usually a slip fit and is reliant on the clamping force of the cylinder head to retain it in position. In standard applications a parallel liner is usually adequate to provide a successful repair. However for added security in high load or high performance applications flange type liners are recommended. Dry liners can be used in the repair of both cast iron and aluminium blocks and even for repairing blocks where no liner was originally fitted. This includes alloy blocks which originally used special surface finishes such as Nikasil and Alusil found in many modern engines including those from manufacturers including Porsche, BMW and Mercedes. The most common liner type used for repairing worn or damaged blocks is a semi-finished dry liner. These can be fitted into both alloy and iron type blocks and can sometimes be purchased as “ready to fit” replacements for some engines. More commonly, they are selected by size for a given application and then machined to meet the specific requirements for the engine being repaired. Dry Liners can be made from either grey cast iron or the more durable ductile type which is more suitable for high performance applications. After mounting the block on our BERCO AC650M boring machine and setting up in the same way as for a rebore, the damaged cylinder bore can be machined out and repaired using a semi-finished dry liner. The repair liner is selected according to the finished dimensions of the bore taking into account the overall length and outside diameter which should be at least three millimetres larger than the finished bore size but not so large as to put undue stress on the block being repaired. The block is then machined out to accept the liner using a series of cuts which minimises stress and distortion. Initial “roughing” cuts can be quite large but the final cut prior to the honing operation will be no more than 0.5mm. A small allowance is left for honing the bore to the exact size to give a small interference fit for the liner to be pressed in to. Having the correct interference ensures that the liner does not move during service and the finish created by this operation also aids heat transfer from the liner to the parent block. If the liner to be used has a flange diameter, the counter-bore to accept this is machined into the top of the block using a specially shaped cutter. The counter-bore diameter is machined to be fractionally larger than the liner top which reduces stress at this point and prevents the liner cracking during service. A small difference between the depth of this counter-bore and the thickness of the liner flange gives an allowance for machining during the final re-facing operation once the liner is installed. Where no flange is present, added security can be achieved by machining the parent bore with a step near the bottom on to which the liner can be seated. This step is machined using the same cutter as for a top mounted flange. When using a repair liner designed specifically for the engine in question the liner can now be fitted however if a generic liner has been selected from the sizes available it will need to be machined to the correct length prior to installation into the cylinder block. This operation is carried out on a standard lathe where the liner is mounted and centralised before being supported with a steady. The liner can then be parted off at the correct length allowing a small amount extra for removal during the final re-facing operation. Following a wash cycle to remove all machining contaminants the block is ready to have the repair liners installed. In the case of iron blocks the liners are pressed into their respective housings using a hydraulic press. For alloy blocks the operation involves first heating the block in our industrial oven. This has the effect of expanding the block which means that each liner can just be dropped into position. This operation can be further assisted by freezing the liner in liquid nitrogen. The nitrogen cools the liner which shrinks it easing the fitting process further. The correct interference is achieved when the block shrinks and the liner expands as the temperatures equalise. After liner installation, alloy blocks are returned to the oven which is then switched off and left for the block to return slowly to its natural temperature. This process also helps to prevent any unnecessary distortion. After fitment in alloy blocks the cooling process sometimes causes the newly fitted liners to creep up in their housings which means that they won’t be fully seated after normal temperature is achieved. To correct this, new liners in alloy blocks are also subjected to pressure under the hydraulic press to ensure they are fully pressed home. Many engines have cut away portions at the bottom of their bores to allow for con-rod rotation or gas transfer during operation. These cut-outs or passages must be recut in the liner after fitment to match the shapes in the original bores. Once the liners are fitted and have been machined the final boring operations can be carried out using our BERCO AC650M machine and the block is refaced on our BERCO ST361 surfacing machine.